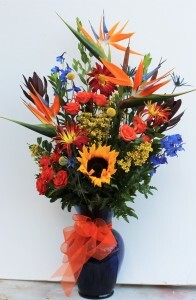 Stunning birds of Paradise, roses, sunflowers, delphinium, rovers, and a multitude of greens and others flowers fill a cobalt blue vase. A large tropical arrangement that really makes an elegant statement. 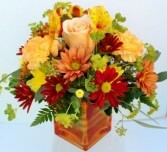 Hearts on Fire is an arrangement that is arranged in a 4" glass cube with a white hydrangea, red roses and wax flower. Show how much you care and show your "heart's on fire"! The higher price is for a larger 6" vase. 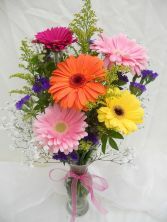 Show your Valentine you are Crazy for her with everybody's favorite, Gerbera daisys! Mixed with bright colorful fillers,gerbera daisys and greenery in flared glass vase. Sure to be a hit!